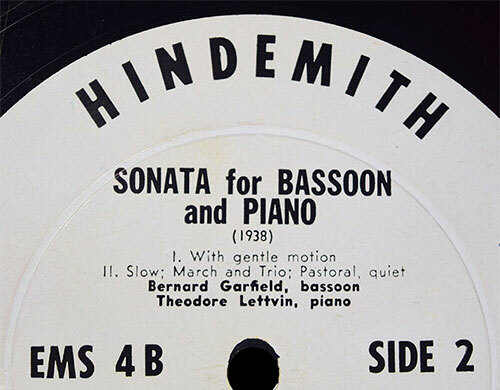 The ear­li­est record­ings of Hindemith’s bas­soon Sonate were made in the Unit­ed States, to which the com­pos­er had emi­grat­ed in ear­ly 1940. As far as I can tell, the very first record­ing of the piece was made by Bernard Garfield (with pianist Theodore Lettvin) on EMS Record­ings, released in 1950. I con­tact­ed the Hin­demith Insti­tute in Frank­furt, and they con­firmed that the Garfield record­ing is the ear­li­est of which they’re aware. 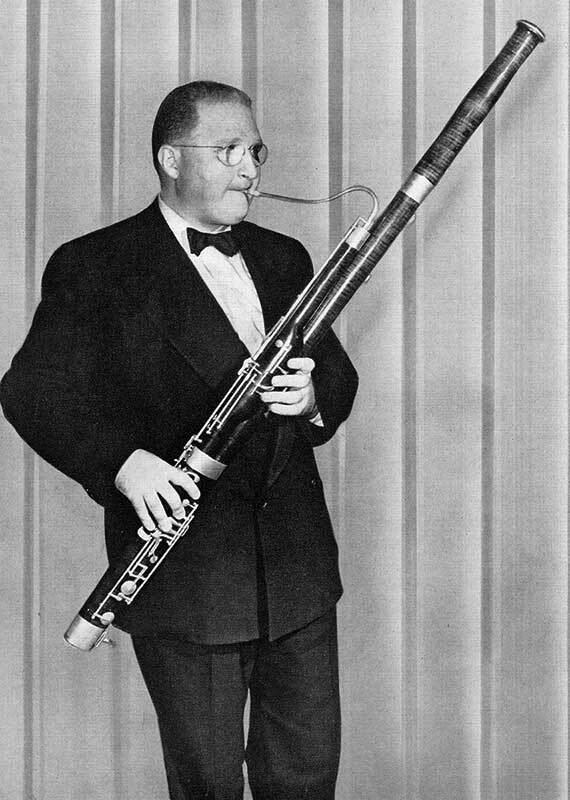 Leonard Shar­row also made an ear­ly record­ing of the piece for the Oxford Record­ing Com­pa­ny, prob­a­bly some time in the 1950s, but I have been unable to find pre­cise dates of record­ing or release. Garfield, who will turn 93 this Fri­day, is best known for serv­ing as the Philadel­phia Orchestra’s Prin­ci­pal Bas­soon­ist from 1957 to 2000. He is one of my grandteach­ers — Jef­frey Lyman, with whom I stud­ied at Ari­zona State, stud­ied with him, among oth­ers. Garfield has also com­posed a num­ber of works, most­ly fea­tur­ing the bas­soon in var­i­ous com­bi­na­tions. His record­ings of some of the pil­lars of the bas­soon reper­toire are still in print, and are eas­i­ly obtain­able, includ­ing the Mozart Con­cer­to and Weber Andante e Ron­do Ongarese (both with Eugene Ormandy and the Philadel­phia Orches­tra). EDIT: Accord­ing to Antho­ny George­son, Garfield acquired the 7000-series Heck­el in the pho­to above after he made this record­ing; he’s using a 9000-series here. Auguste Mes­nard was born Novem­ber 17, 1875 in Cognac, France. He began his musi­cal career as a vio­lin­ist, study­ing at the Ecole Nationale de Musique d’Angoulème, and earn­ing a first prize from there in 1891. After an unsuc­cess­ful audi­tion to enter the Paris Con­ser­va­toire, one of his musi­cal col­leagues in Angoulème sug­gest­ed that he take up the bas­soon instead. He evi­dent­ly took to the instru­ment right away, as he man­aged to gain entry to Eugène Bourdeau’s bas­soon class at the Paris Con­ser­va­toire only two years lat­er (Novem­ber 1893). He won a first prize there in 1897, and went on to bas­soon posi­tions in the Con­certs Rouge, Orches­tra Lam­oureux, and Soci­eté Nationale de Musique. In his posi­tion as sec­ond bas­soon­ist with the Orches­tra Lam­oureux, he played the pre­mieres of Debussy’s Noc­turnes and L’Après-midi d’un faune. Mes­nard began writ­ing his mem­oirs in 1943, short­ly before his retire­ment, and worked on them over the next decade or so. These were nev­er pub­lished, but copies of the type­script reside in the libraries of South­ern Illi­nois Uni­ver­si­ty and the Inter­na­tion­al Dou­ble Reed Soci­ety. I haven’t been able to exam­ine this yet myself, but French bas­soon spe­cial­ist Lau­rence Ibisch wrote an arti­cle about Mes­nard in the Octo­ber 1978 issue of The Dou­ble Reed, with infor­ma­tion tak­en from the mem­oirs.5 Unless oth­er­wise not­ed, all the infor­ma­tion in the pre­ced­ing bio­graph­i­cal sketch comes from Ibisch’s arti­cle. 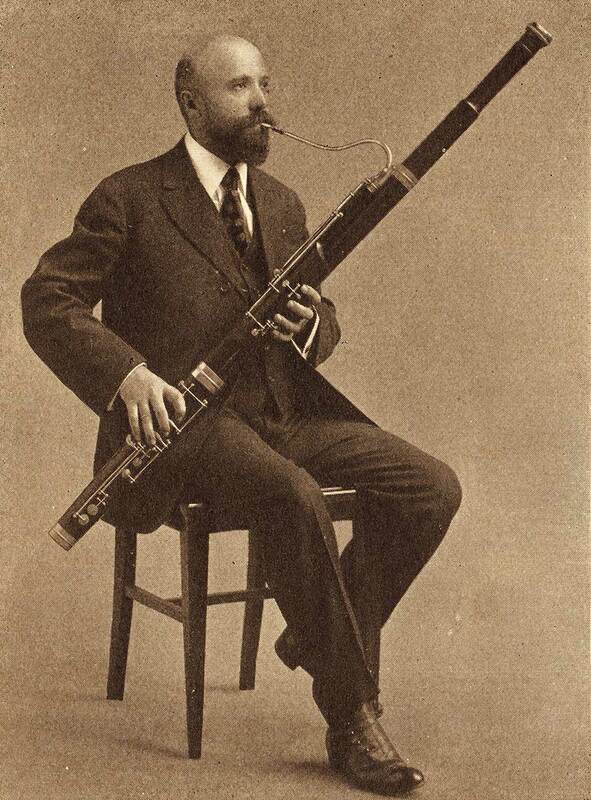 Ibisch also owns and reg­u­lar­ly plays on Mesnard’s Buf­fet bas­soon — the very one in the pho­to above.6 It was made in 1900, and has six­teen keys (rather than the 22 present on the Jan­court “per­fect­ed” sys­tem). Buf­fets are com­mon­ly made of rose­wood, but this instru­ment has only a rose­wood wing joint. The rest of the instru­ment is made of much lighter maple, which is more com­mon for Ger­man bas­soons. Dur­ing his tenure with the New York Phil­har­mon­ic, Mes­nard also worked worked as a record­ing artist for the Colum­bia Gramo­phone Com­pa­ny. Record­ing com­pa­nies in that era gen­er­al­ly didn’t cred­it indi­vid­ual orches­tra mem­bers, so it’s prob­a­bly impos­si­ble to know how many ensem­ble record­ings he par­tic­i­pat­ed in. His one record­ing as a soloist was made on Octo­ber 14, 1916 — a duet with harpist Charles Schuet­ze. 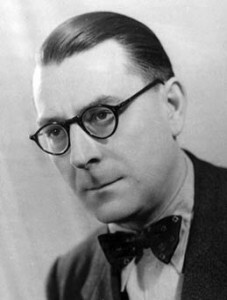 The piece they record­ed, Ser­e­nade by Edmond Fil­ip­puc­ci (1869–1948), is almost cer­tain­ly an arrange­ment. Filippucci’s music is not easy to come by today either in print­ed or record­ed forms, so I haven’t been able to iden­ti­fy the piece itself. But a like­ly can­di­date is his 2 Pièces pour vio­lon avec accom­pa­g­ne­ment de piano: Nº 1. Séré­nade, pub­lished in 1894. 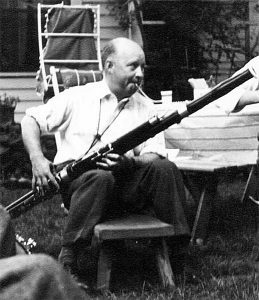 Mesnard’s also record­ed “The Ele­phant and the Fly” with flutist Mar­shall Lufsky in Decem­ber 1916, but this was evi­dent­ly nev­er released.9 His col­league Ben­jamin Kohon record­ed the same piece in 1918 for Edi­son Records. That ver­sion was released, and is avail­able to stream from the UCSB Cylin­der Audio Archive. 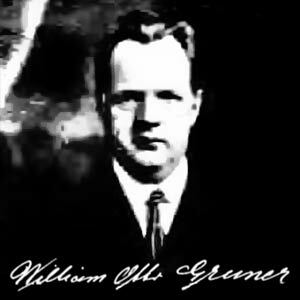 I’ve writ­ten pre­vi­ous­ly about the three ear­li­est record­ings of Carl Maria von Weber’s Andante and Hun­gar­i­an Ron­do — two fea­tur­ing Ger­man-Amer­i­can bas­soon­ist William Gruner (1920 and 1926), and one with French bas­soon­ist Fer­nand Oubradous (1938). As a num­ber of peo­ple point­ed out, I left out anoth­er ear­ly record­ing by Eli Car­men from the late 40s. I didn’t have a copy at the time, but I’ve man­aged to get my hands on one now. This one’s a bit of an odd­ball: it’s only the Ron­do, it was record­ed for a children’s record label, and it was released on a vinyl 78rpm disc. As far as I can tell, this record­ing has nev­er been rere­leased, but you can lis­ten to it below. 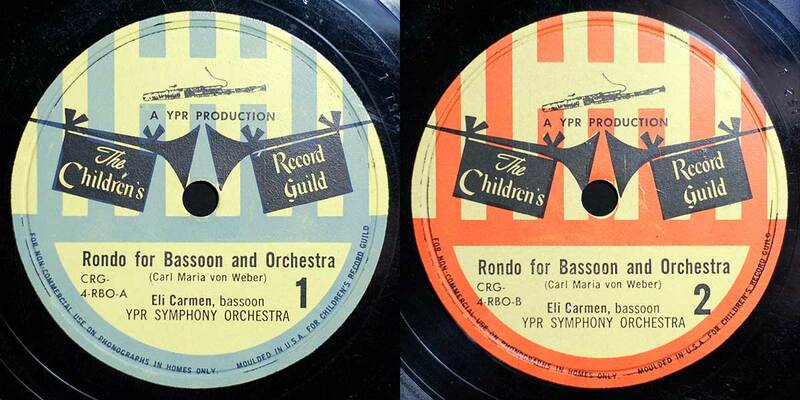 Both labels of my disc — a lat­er Children’s Record Guild release, orig­i­nal­ly record­ed for Young People’s Records. Click for a larg­er ver­sion. Car­men appeared on a great num­ber of orches­tral record­ings with the NBC Sym­pho­ny, as well as record­ings of cham­ber music by Beethoven, Lud­wig Spohr, Arthur Berg­er, and Mel Pow­ell. He also record­ed Vivaldi’s Con­cer­to in G minor, “La Notte” with flutist Julius Bak­er on Odyssey.4 But this par­tial Weber is his only tru­ly solo record­ing. 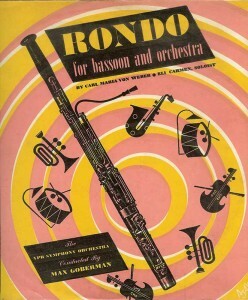 The ron­do way of telling musi­cal ideas is to keep com­ing back to the first idea, or melody. In this ron­do — its full name is Hun­gar­i­an Ron­do for Bas­soon and Orches­tra — we hear a melody, then a new melody, then the first melody, then anoth­er new melody, then the first melody again. Some­times these melodies are played by the bas­soon alone, some­times by the orches­tra alone and some­times by bas­soon and orches­tra. For more about Young People’s Records and the Children’s Record Guild, see David Bonner’s 2008 book Rev­o­lu­tion­iz­ing Children’s Records and his web site: yprcrg.blogspot.com. The Shel­lackophile has also dig­i­tized and post­ed a num­ber of YPR titles, which you can down­load (thanks to him for the image of the cov­er above, as it’s miss­ing from my disc). The vast major­i­ty of peo­ple who have record­ed bas­soon in jazz con­texts have been dou­blers who pri­mar­i­ly play sax­o­phone, such as Illi­nois Jacquet, Frankie Trum­bauer, and Ben Wen­del. A very small num­ber of play­ers (Paul Han­son and Michael Rabi­nowitz are the best known) tru­ly spe­cial­ize in play­ing jazz on the bas­soon. But there is a third cat­e­go­ry as well: orches­tral bas­soon­ists who have occa­sion­al­ly ven­tured into jazz con­texts. In 1935, Sol Schoen­bach record­ed four tunes by British jazz pianist Regi­nald Foresythe in a small group that also includ­ed Ben­ny Good­man and Gene Kru­pa. Ken­neth Pas­man­ick, long­time prin­ci­pal bas­soon­ist of the Nation­al Sym­pho­ny Orches­tra, played on two albums by gui­tarist Char­lie Byrd. And Manuel Ziegler, prin­ci­pal bas­soon­ist of the New York Phil­har­mon­ic from 1957 to 1981, record­ed a num­ber of albums in the late 1950s with Gun­ther Schuller, the Mod­ern Jazz Soci­ety, and the Mod­ern Jazz Quar­tet. …we team up with Klaus Thune­mann, who is solo bas­soon­ist in the ‘North­ern Ger­man Radio Sym­pho­ny Orches­tra’ (NDR), pro­fes­sor at the Han­nover Col­lege of Music, and who plays Schön­berg under Pierre Boulez equal­ly as com­pelling­ly as he does Vival­di with the ‘I Musi­ci di Roma.’ I believe it was pre­cise­ly this dis­tance from which Thune­mann has for many years and with inter­est viewed jazz, that pro­vid­ed the stim­u­lus which inspired us when we made this record­ing. Thune­mann fig­ures promi­nent­ly in three of the album’s six tracks. “Sal­va­tore” opens the album, and at 11:38, is by far the longest tune on the record. 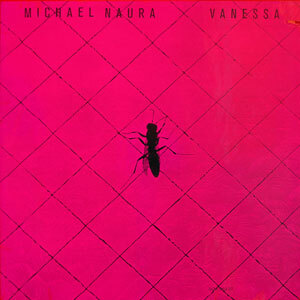 It fea­tures a soar­ing, lyri­cal bas­soon melody fol­lowed by two and a half min­utes of impro­vi­sa­tion by Thune­mann. Schlüter takes his turn, then the whole group engages in some very open-end­ed impro­vi­sa­tion, includ­ing some bas­soon mul­ti­phon­ics. The bas­soon melody returns at the end. “Baboon” begins and ends as a dirty, funky tune in which Thune­mann explores a rough and even some­times growl­ing tone. The mid­dle is a blaz­ing­ly fast group impro­vi­sa­tion that does not include bas­soon. Thune­mann gets a co-writ­ing cred­it on the album’s last tune, “Black Pigeon”. It opens with almost two min­utes of bas­soon impro­vi­sa­tion — much of it com­plete­ly solo. About two min­utes in, it launch­es into a mid-tem­po groove, with bas­soon melody and a long marim­ba solo from Schlüter. Thune­mann takes anoth­er solo turn before return­ing to the melody at the end. All in all, this album con­tains the most exten­sive and impres­sive impro­vi­sa­tion I’ve heard from some­one we think of as a one of the giants of the “legit” bas­soon world. 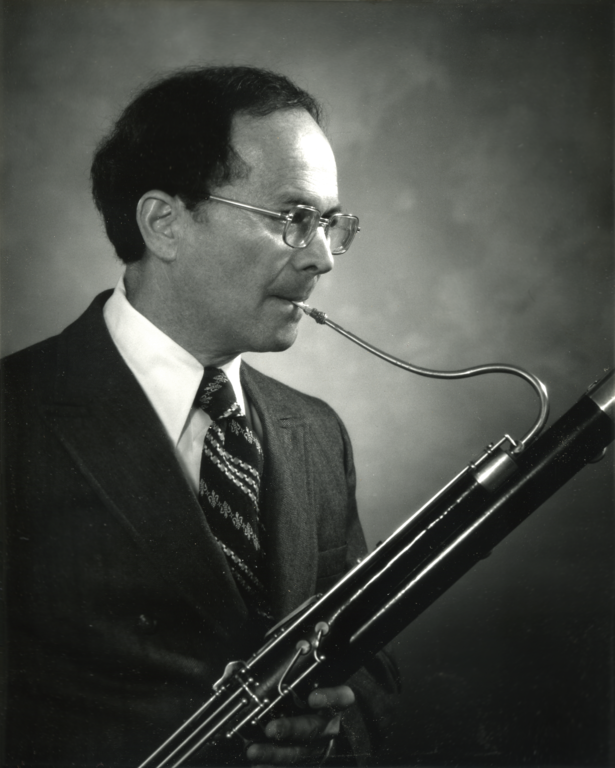 Thune­mann sounds at ease in the ensem­ble, and uses his con­sid­er­able tech­nique to great advan­tage, run­ning all over the horn and engag­ing in extend­ed tech­niques such as mul­ti­phon­ics, growl­ing, and pitch bends. He even, much to my delight, explores realms of tone very dif­fer­ent from what you hear on, say, his well-known record­ing of the Weber Con­cer­to. 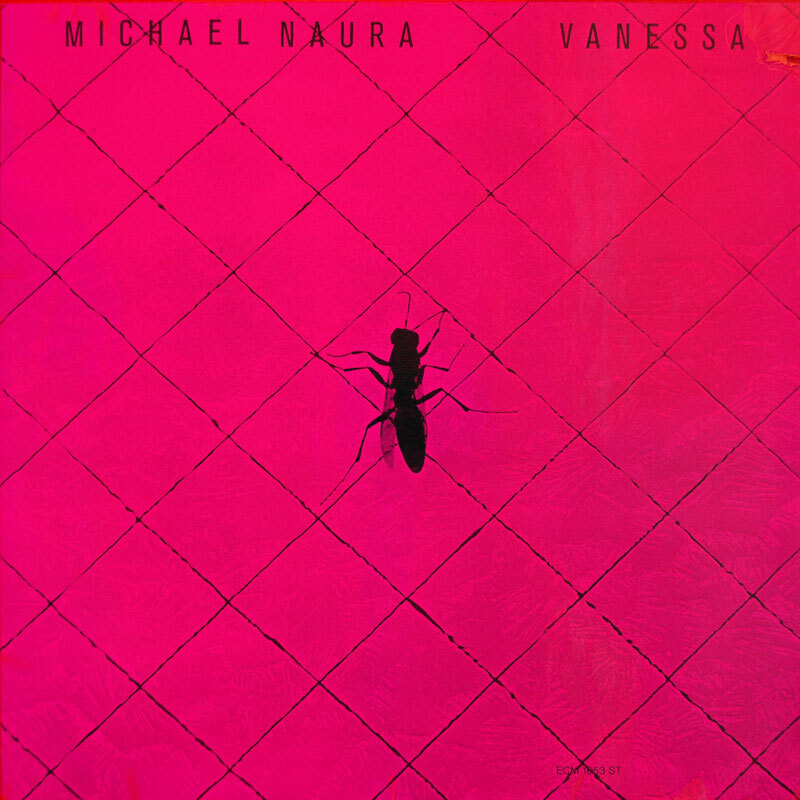 You can read a more gen­er­al review of the album on the between sound and space blog. I learned of the exis­tence of this album while work­ing on my dis­ser­ta­tion on the bas­soon in jazz, and includ­ed it my discog­ra­phy. But at the time I wasn’t able to actu­al­ly get my hands on a copy — it hasn’t ever been rere­leased on CD. The first time I heard any of it was when Jolene Masone post­ed one track last year as part of the “Best Bas­soon Week Ever!” series on her blog. That one tune blew me away, and I renewed my search for the album, final­ly snag­ging a copy on eBay. Be sure to check out the free impro­vi­sa­tion (includ­ing bas­soon mul­ti­phon­ics), which starts around the 10-minute mark in this live ver­sion. And if that’s not your thing, the band returns to the form around 12:25. Most of the ear­ly record­ings that fea­ture the bas­soon did so in a com­i­cal fash­ion. A hand­ful of artists record­ed Quentin Ashlyn’s song “The Bas­soon” in the first decades of the 20th cen­tu­ry, and I have in my col­lec­tion a cou­ple of very strange (at least to mod­ern ears) “laugh­ing records” from the same era that include the bas­soon. In 1911, Carl Borg­wald record­ed Julius Fučík’s clas­sic “Der Alte Brumm­bär” in 1911 (released as “Pol­ka Fan­tas­tique” in the U.S.). And in 1918, Edi­son released two some­what sil­ly piccolo/bassoon duets: “The Ele­phant and The Fly” and “The Nightin­gale and the Frog”, both fea­tur­ing Ben­jamin Kohon, who would lat­er become prin­ci­pal bas­soon­ist of the New York Phil­har­mon­ic. The ear­li­est “seri­ous” bas­soon piece on disc (the ear­li­est that I’ve been able to locate, any­way) was not the Mozart Con­cer­to, as one might guess. Rather, it was Carl Maria von Weber’s Andante e Ron­do Ongarese. In fact, this Roman­tic show­piece was record­ed three sep­a­rate times between 1920 and 1938. Aside from being his­tor­i­cal curiosi­ties, these record­ings give us a glimpse of ear­ly twen­ti­eth cen­tu­ry bas­soon play­ing. And as far as I can tell, none of these record­ings have ever been re-released. Below you will find copies of all three, dig­i­tized from discs in my col­lec­tion. I’ve applied a bit of noise reduc­tion and removed the worst of the pops and clicks, but these are far from pro­fes­sion­al-qual­i­ty trans­fers. I’d rec­om­mend lis­ten­ing to these on head­phones or real speak­ers, as they may be a bit dif­fi­cult to hear on lap­top, tablet, or phone speak­ers. The three discs in chrono­log­i­cal order. Click for a larg­er ver­sion. When Gruner made this record­ing in 1920, the tech­nol­o­gy involved was quite sim­i­lar to that invent­ed by Thomas Edi­son 43 years ear­li­er: the per­form­ers played into a large horn that trans­mit­ted sound waves to a flex­i­ble diaphragm con­nect­ed to a sty­lus that cut the sound direct­ly onto a wax disc. This method pro­duced record­ings with lim­it­ed fre­quen­cy and dynam­ic range and required per­form­ers to crowd around a sin­gle horn to be heard. But in 1925 Vic­tor (and many of their com­peti­tors) adopt­ed a new elec­tri­cal record­ing process that used micro­phones, vac­u­um tube ampli­fiers, and an elec­tro­mag­net­ic record­ing head. This sys­tem allowed for much greater dynam­ic and fre­quen­cy response, and pro­duced a gen­er­al­ly much bet­ter sound­ing record­ing. If you made it all the way through Gruner’s 1920 record­ing, you prob­a­bly don’t need to lis­ten to all of this one. His inter­pre­ta­tion doesn’t change appre­cia­bly, although it is inter­est­ing to hear the dif­fer­ences between the two record­ing process­es. 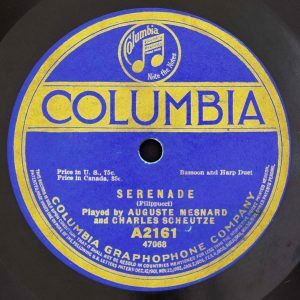 The French bas­soon­ist Fer­nand Oubradous record­ed Andante e Ron­do Ongarese in Paris in 1938, accom­pa­nied by the Orchestre de la Société des Con­certs du Con­ser­va­toire under the direc­tion of Roger Désormière. Oubradous was born in Paris on Feb­ru­ary 12, 1903. He won his Pre­miere prix from the Paris Con­ser­va­toire in 1923 — after only a sin­gle year of bas­soon study. He played with the Paris Opéra, the Orchestre Lam­oureux, the Orchestre de la Société des Con­certs du Con­ser­va­toire, and the Trio d’Anches de Paris. In addi­tion to Weber’s Andante e Ron­do Ongarese, Oubradous record­ed con­cer­ti by Mozart, Weber, and Bois­morti­er and a great deal of cham­ber music. But his first job after grad­u­at­ing from the Con­ser­va­toire was as music direc­tor of the Théâtre de l’Atelier, and he received much acclaim as a con­duc­tor through­out his career. Oubradous died in Paris in Jan­u­ary 1986.3 For more on Oubradous, see these two sites (both in French): fernand.oubradous.free.fr and Fer­nand Oubradous — Site de l’association Fou de Bas­son. 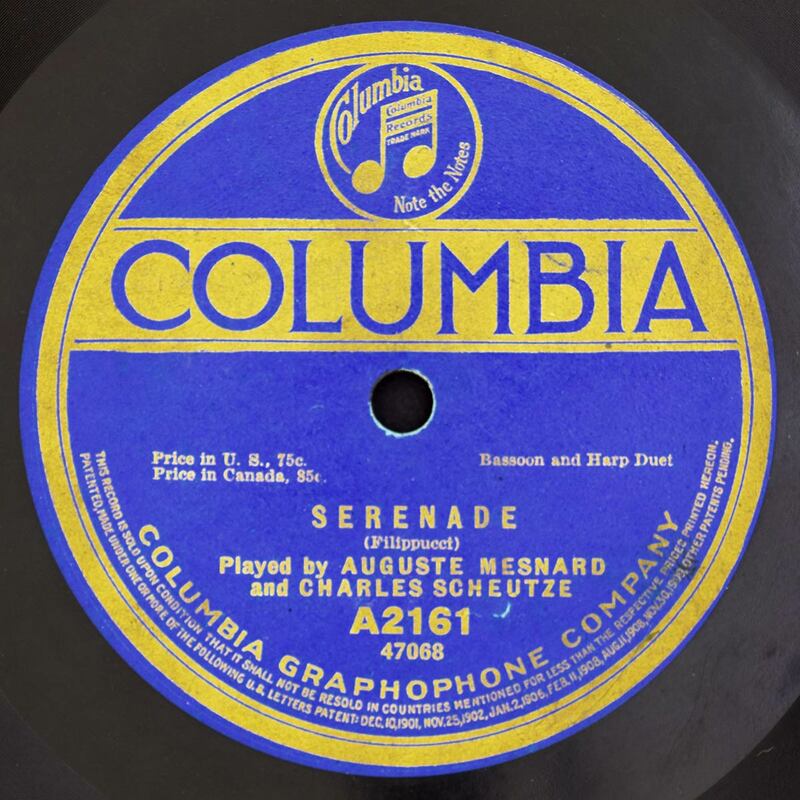 Oubradous’s record­ing of the piece is near­ly com­plete, thanks to it being issued on both sides of a twelve-inch 78rpm disc (L’Oiseau-Lyre O.L. 14). This is like­ly attrib­ut­able to the fact that Édi­tions de l’Oiseau-Lyre has always had a more spe­cial­ist and schol­ar­ly focus than more mass-mar­ket com­pa­nies like Vic­tor. Side A is the Andante, which is just over four min­utes long. The Ron­do (on side B) is slight­ly longer at four min­utes and six­teen sec­onds. The Ron­do had to be cut down a bit to fit; forty-two mea­sures have been excised. This is most­ly most­ly repeat­ed themes and sec­tions of orches­tral inter­ludes, but the entire last state­ment of the ron­do theme has been removed as well. There’s one oth­er inter­est­ing change: the four mea­sures of quar­ter-note trills in the mid­dle of the last flashy sec­tion have been tak­en out of the solo part and giv­en to one of the orches­tral bas­soon­ists! It’s clear that record­ing tech­nol­o­gy and disc man­u­fac­ture had improved quite a bit in the 12 years since Gruner’s sec­ond record­ing. The bas­soon is clear­er and more present (the fact that he was play­ing a French bas­soon helps, too), and the orchestra’s sound has far more depth and def­i­n­i­tion. Frankly, the qual­i­ty of the bas­soon play­ing is much high­er, as well. Although this par­tic­u­lar record­ing hasn’t been rere­leased, you can occa­sion­al­ly find Oubradous’s Mozart Con­cer­to on CD on Ama­zon, or as mp3s here.